At Academy of Floral Art, join our private classes and learn how to decorate a wonderful Christmas Wreath or Christmas Table Flower Design and Christmas gifts for a family/friend’s Dinner Table. All flowers, foliage, vases, containers, decorations and florist sundries are included in our price of $380 for a 3 hour class of creative fun and relaxation. Class times are 11 a.m. to 2 p.m. + lunch break. There is nothing more personal than to give a hand-made present, made with love and care. Save money this year on your presents and for years to come, as you will learn so much in our 1 day Workshop – call us to enrol in our December classes at least a month before. Join our exciting classes at Academy of Floral Art, you will have a choice of what you would like to make to take home from the following list of designs for Christmas. 1. Christmas Table Design in fresh flowers – your choice of colours in a ceramic container, with Christmas decorations or candles – either Circular, Oval or Rectangular Designs. 2. Christmas glass or ceramic Gift-box Arrangement of brightly coloured fresh Christmas flowers. 3. Wreath for your home in fresh Little Gem Magnolia Leaves, double sided dark green/rusty brown, looks wonderful inside the house or on your front door. 5. Christmas Wreath in either fresh flowers and Christmas Decoration or with a variety of gum-nuts, tetra nuts, pinecones, etc. and quality Christmas ribbons. 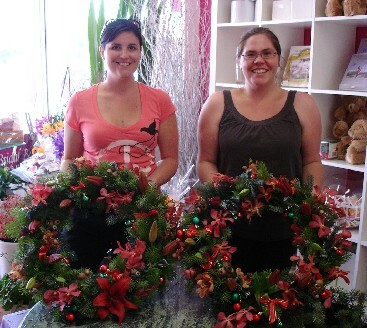 Christmas Wreath & Christmas Table Flower Classes include all fresh flowers, decorations, containers and materials. Your designs completed to take home are worth more than the cost of your classes. Our Christmas Wreath & Christmas Table Flower Classes are a wonderful way to express yourself and find your flair with colour and the art of flower arranging. You will be trained by Accredited and experienced Teachers who are happy to share a wealth of knowledge and skills, and encourage you to express your creativity. It’s never too late to follow your passion and never too late to learn new skills, make your dream come true now at the Academy of Floral Art. Contact us now and enrol in our Christmas Wreath and Christmas Table Flower Classes, all ages are welcome!